Our Syrian customers visited Beston factory and purchased two sets of BTF-5-8 egg tray making machines. Each machine can produce 7000 pieces of paper egg trays per hour. Together with our delicate design of egg tray molds, these two machines will be very helpful for professional paper egg tray manufacturers. BTF-5-8 is an eight-sided rotary molding machine. And there are 5 molds on each side. The operating speed ranges from 18 to 29 times each minute. It turns out that the hourly output of the semi-automatic type is more than 5000 pieces. While the fully automatic one is capable of making 7000 pieces of egg trays hourly. However, just 5 to 7 workers can easily run the entire process. 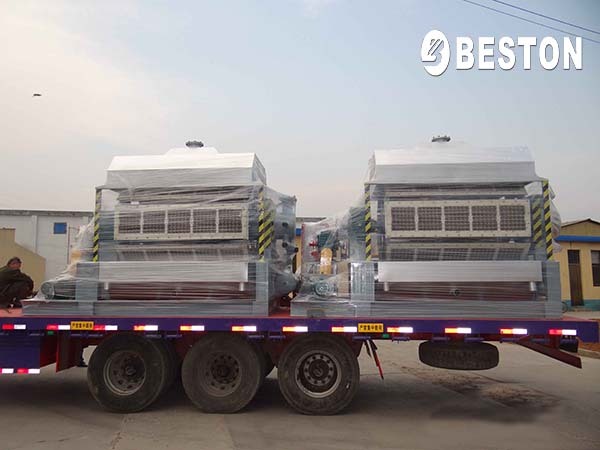 Eight-side egg tray making machines are always the best-selling product of Beston Machinery, especially BTF-4-8 and BTF-5-8. These two models are preferred by professional egg tray manufacturers. Beston Machinery can also offer dismountable pulp molding dies. And it is very easy to change the molds. That is to say, you can produce various paper pulp molding products with the same pulp molding equipment. Obviously, you can save much money. There are explicit teams in Beston, including experienced technical team, elite design team, multilanguage sales team, large customer service team, etc. Beston has grown into a sizeable pulp molding machinery no matter the scale and experience. In short, you can get the best product and service when you contact us. Beston Machinery has been committed to paper pulp molding machines for about 20 years. Our pulp molding machines began with manual flip type, reciprocating type, and developed into rotary molding machines. The whole pulp molding production line is getting automated, mature and complete. Meanwhile, we have exported our products to many countries all over the world, such as Russia, Algeria, Egypt, Ukraine, Brazil, etc. You will feel satisfied to partner with us.